This is Hamlet, but not as you know it. 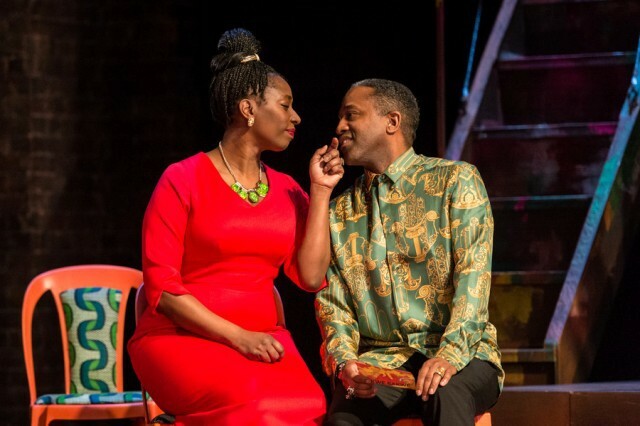 Director Simon Godwin has breathed new life into the classic tale to merge Shakespeare's prose with an exciting, fresh backdrop set in Africa. It's familiar, yet unfamiliar, and from this modern reworking sparks an excitement to see what comes next. 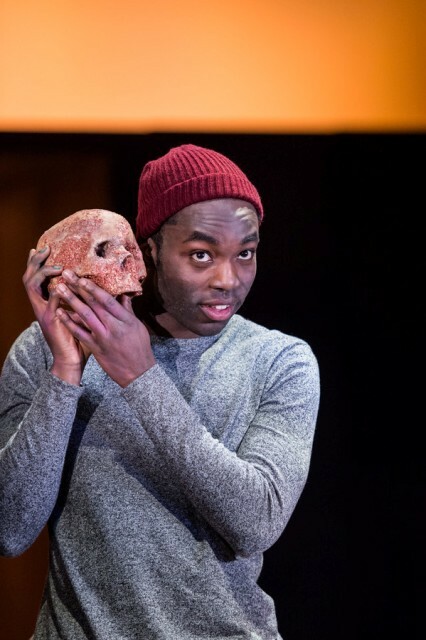 Paapa Essiedu is very natural in the role of Hamlet for the RSC. Hamlet has been a regular for the Royal Shakespeare Company (RSC) in recent years. There was the notable Gregory Doran modern version starring David Tennant in 2008 and David Farr's production with a sneering Jonathan Slinger in 2013, but both not veering to far from the expected. This time around there's bright young thing Paapa Essiedu in the lead role. He's the first Black actor to play the Danish prince for the RSC but that's not why this is a stand-out performance, it's because he's an exceptional performer. Essiedu is unbelievably relaxed and natural on stage. He's youthful, difficult and sarcastic the way that Hamlet should be, spraying graffiti over a portrait of his mother and uncle and vandalising their thrones with toilet stickers. The main difference is that the rotten state of Denmark has been transported into a militarised African country. Tribal drummers accompany key moments including Hamlet's encounter with the ghost of his father and the final fight scene using long wooden poles, in keeping with the cultural surroundings. This contemporary African setting fits well with a storyline of coups and military threats. It also lends itself well to 21st Century action with Laertes returning home by dropping down to stage by rope from a helicopter and Hamlet armed with a handgun for most of the play. There's a sense of the dictator too surrounding Hamlet's uncle(Clarence Smith), who is a smooth-talking, politician hiding his demons well. He's suitably convincing as a two-faced murderer caught out by his nephew. Importantly, Essiedu has the charm to keep you in Hamlet's corner and delivers the famous lines like they are second nature. His mental anguish sees an outlet through art as his room has become a painting studio where huge canvasses hang. 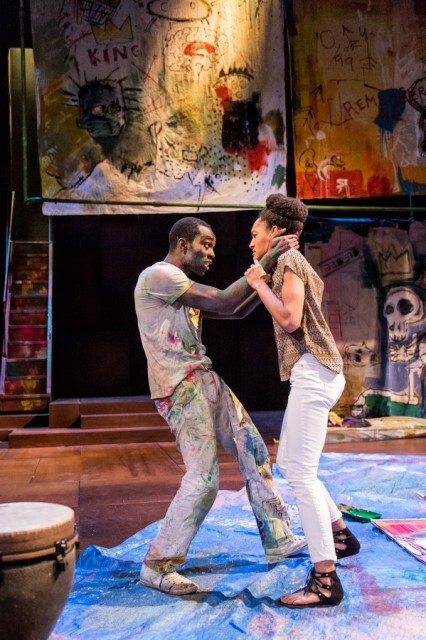 Hamlet himself is constantly splattered with paint. It's a clever touch linking the madness theme and art. Opposite him as Ophelia is Natalie Simpson, who impresses towards the latter part of the play when she depicts the maddened girl with such an acute sense of vulnerability, it brings a lump to the throat. There's also a fresh take on Rosencratz and Guildenstein as male and female British school friends from Hamlet's studying days abroad. They are very much the white tourists visiting an African land and unaware of the state of affairs going on around them. Although there are times when the diction of the supporting cast is not as clear and audible as it can be and that could do with some improvement. That said, this new RSC production of Hamlet is a refreshing take on Hamlet that offers a well thought out alternative offering, particularly to younger audiences. 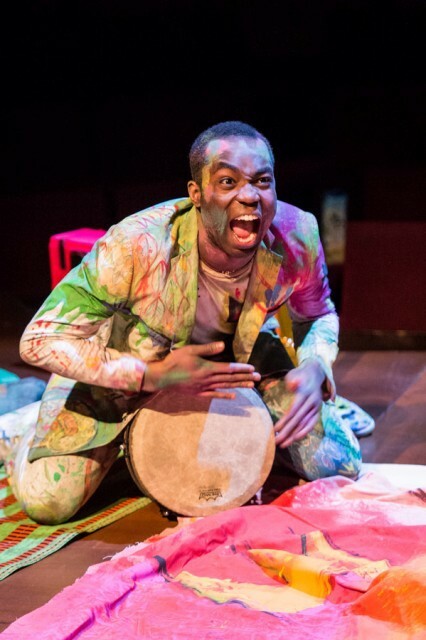 It keeps the essence of Shakespeare's age-old text while adding the excitement of something new, but most of all, it introduces the huge talent of Essiedu to a wider audience.